Some sociologists characterize generation Z as lazy, self-absorbed individuals, who are only able to interact with the world via the glow of handheld devices. 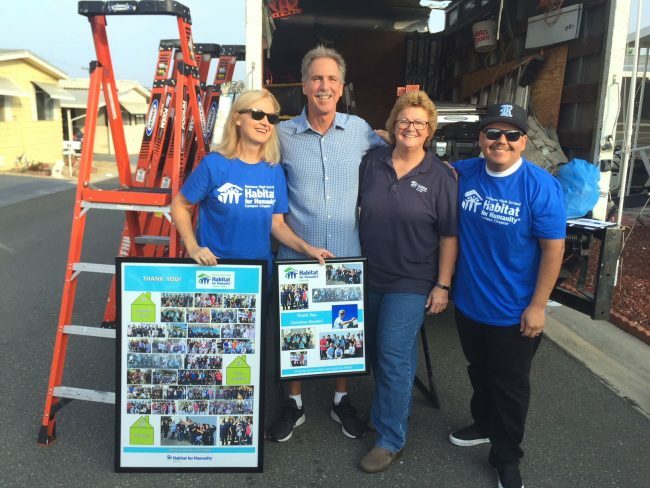 Well, those folks have never met the Ramona High School Campus Chapter of Habitat for Humanity Riverside! This past Saturday, October 6, 2018 was special for many reasons. 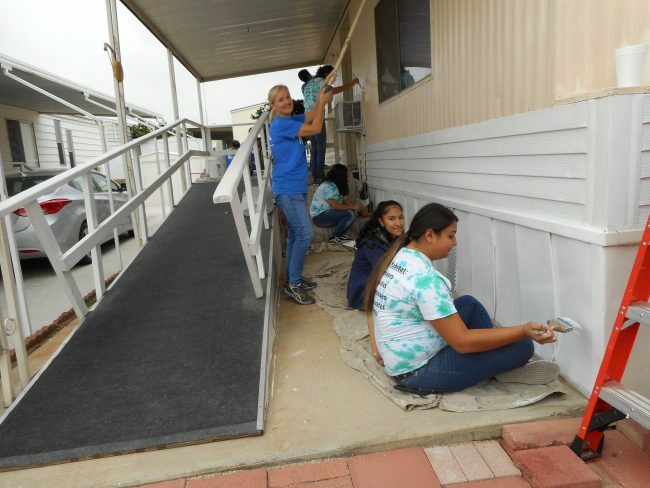 First, we had the opportunity to help our friend Donna by giving her house a fresh coat of paint. Second, we were able to celebrate our 600th home improvement project. 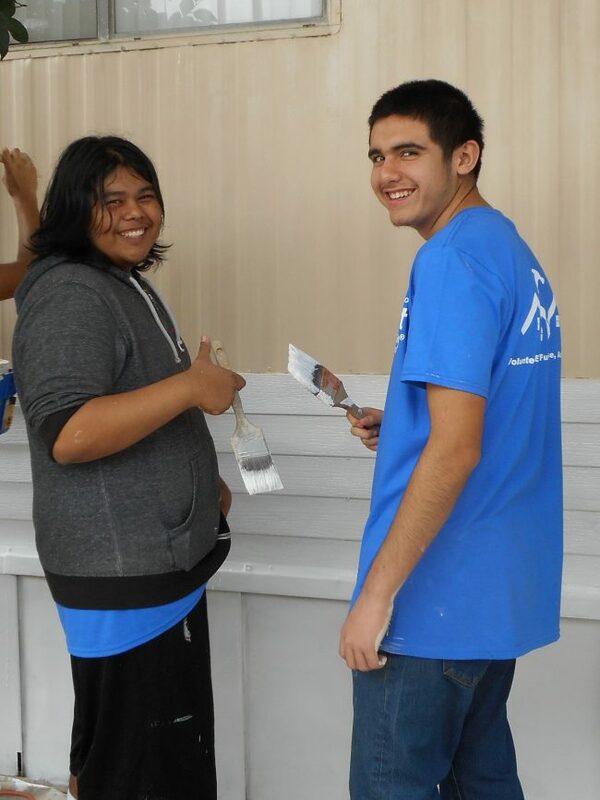 And lastly, but also significantly, we worked with some of our favorite volunteers from the Ramona High School Campus Chapter. Students patiently await a briefing on safety and other best practices. 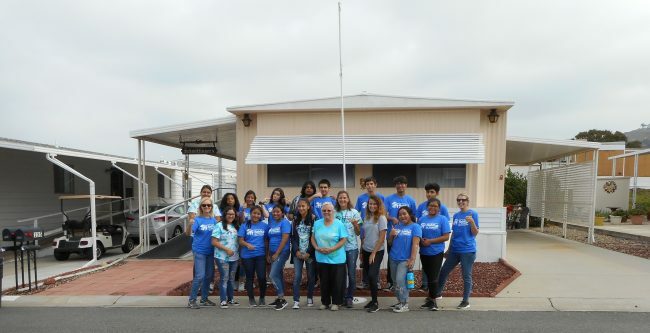 Staff, students, and Habitat representatives take part in recognizing the mutual accomplishments of Ramona HS and Habitat for Humanity Riverside. 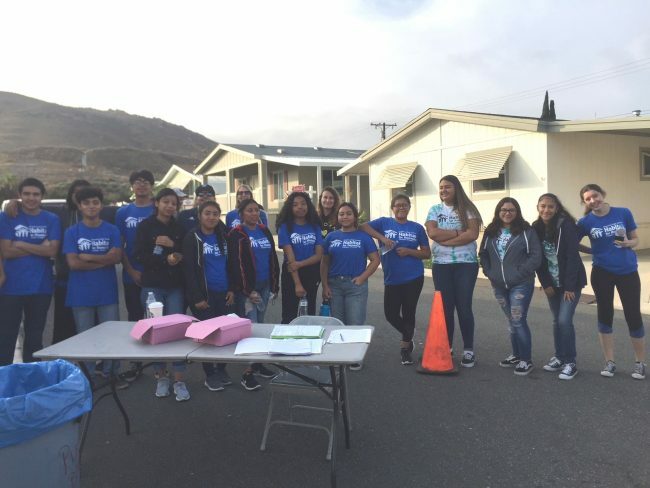 After the accomplishments of both organizations were recognized and the volunteers were directed on best practices for safety and effectiveness, the students quickly got to work. After the many projects we have completed over the recent hot summer, the overcast conditions were most welcome, enhancing the volunteers’ enthusiasm. Students giddy at the prospect of ending up on this blog. 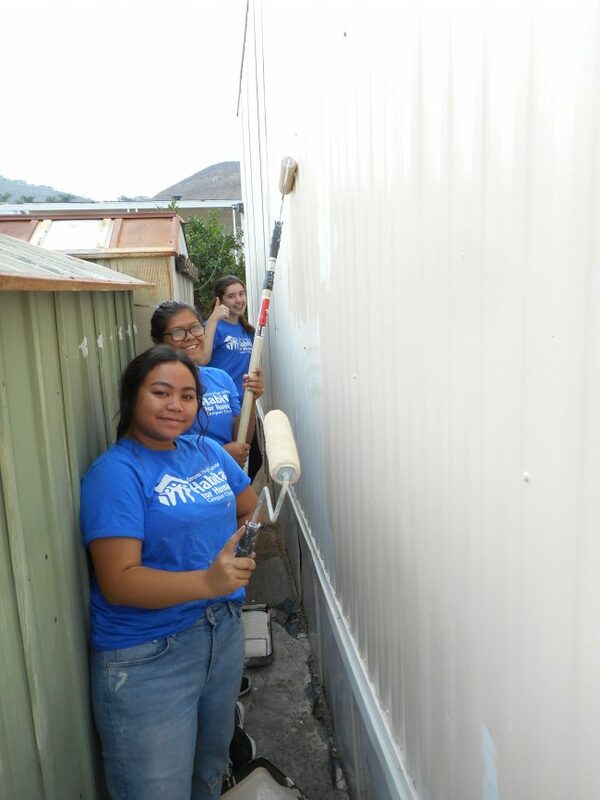 Ambitious students tackle the back portion of the house, where they have to squeeze themselves into position to get the job done. While we were amazed by the quickness and quality of the students work, Christine (Ramona Chapter’s recently retired advisor) and Courtney (English Teacher at Ramona High School) let us know that these students amaze on a daily basis. Sharing anecdotes on academic excellence, good-heartedness, and lofty aspirations, our amazement of the students at Ramona High School increased even more than before. 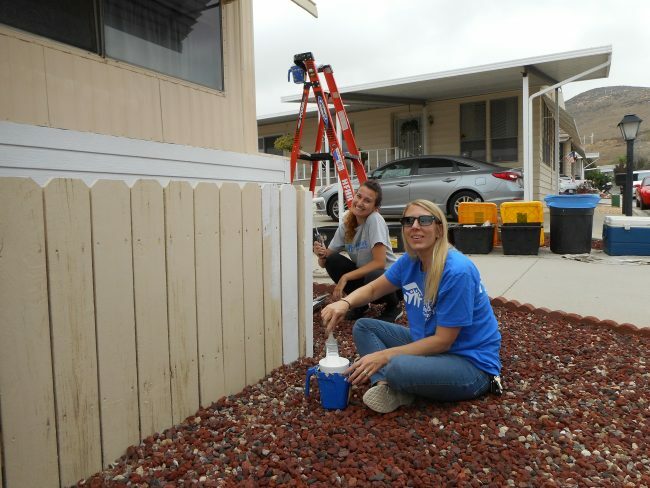 Courtney (right) shares anecdotes about the students while painting the fence. Christine (in blue) helps students with words of motivation and by addressing the higher portions of the home. Thank you to the Campus Chapter at Ramona High School! 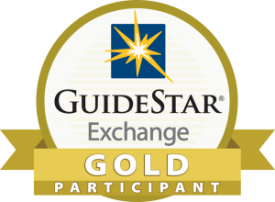 We look forward to a lasting partnership that yields thousands of more volunteers, hundreds more projects, and countless lives touched. The volunteers posing with the homeowner, Donna (middle), in front of the completed project.